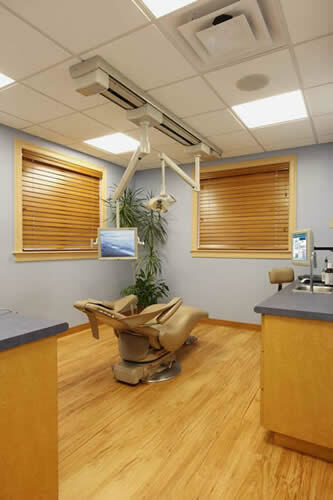 THE OPERATORY'S WARM WOOD FINISHES & COOL SEA BLUES CREATE A RELAXING ENVIRONMENT FOR DENTAL PATIENTS. THE MAINTENANCE PROOF WOOD LOOK FLOORS ARE EASY TO CLEAN & HYGENIC. 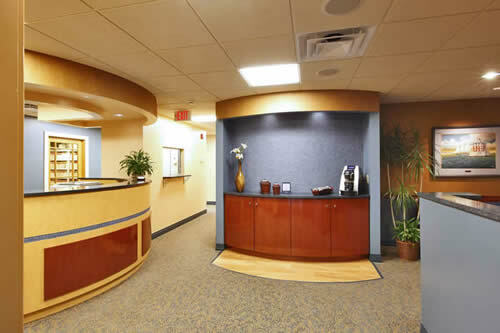 THE CURVILINEAR SHAPE OF THE CHECK-IN DESK AND THE ADJACENT GLASS TILE WALL BEHIND THE BEVERAGE BAR, HELP TO SOOTHE PATIENTS' EMOTIONS AND PREPARE THEM FOR THEIR PROCEDURES. CLOSE UP DETAIL OF CHECK-IN COUNTER. 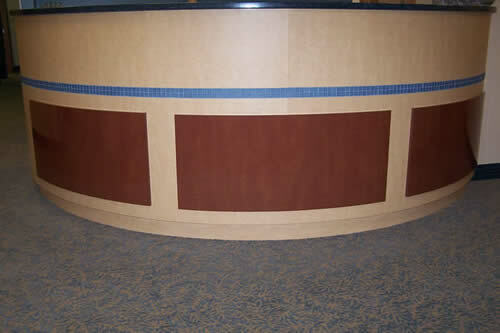 NOTICE THE BLUE INLAID TILES AND THE TWO TONED WOOD LOOK LAMINATES USED. BUT CLOSE AT HAND. WOOD FLOORING WAS USED AROUND THE COUNTER FOR EASY CLEANUP OF SPILLS. THE SHAPE FOLLOWS THE CURVE OF THE CABINETS, WALL AND SOFFIT ABOVE. 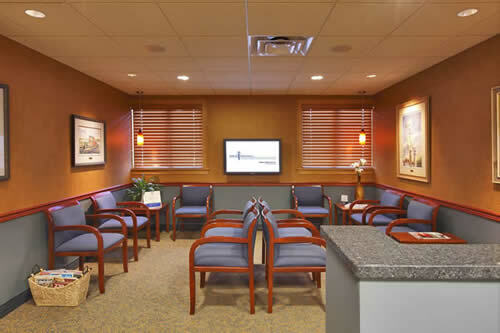 "IT ALL STARTED WITH THE CHAIRS," DR TOBACK ASKED FX DESIGN TO REUSE HIS EXISTING WAITING ROOM SEATING IN THE NEW INTERIORS. THE CHAIRS WERE THE ONLY ORIGINAL ELEMENT REUSED IN THE RENOVATED PRACTICE. LAURA SELECTED A CARPET THAT BROUGHT THE BLUE FROM THE SEATING UPHOLSTERY INTO THE CARPET. 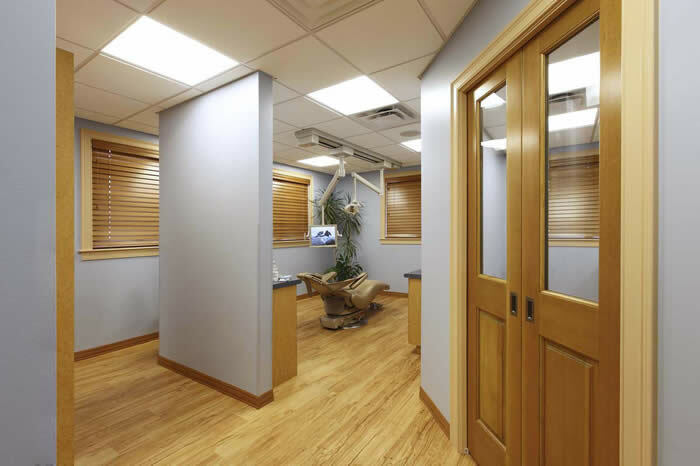 THE REAL TRICK WAS TO UTILIZE THE DARK WOOD FINISHES IN THE PUBLIC AREAS, WHILE ADDING A LIGHTER WOOD THROUGHOUT THE OPERATORIES TO KEEP THEM WARM, YET LIGHT ENOUGH TO PERFORM DENTAL PROCEDURES. STAFF & STUDENT TEACHING LAB. 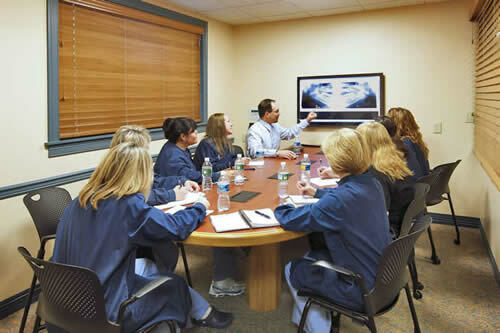 THE X-RAY CONSULT ROOM WAS DEVELOPED TO PROVIDE PATIENTS WITH A DIRECT VIEW OF THE LARGE SCREEN TV MONITOR, TO CLEARLY SHOW PATIENTS WHY THE DOCTOR IS RECOMMENDING THEIR COURSE OF TREATMENT. It's all in the details. 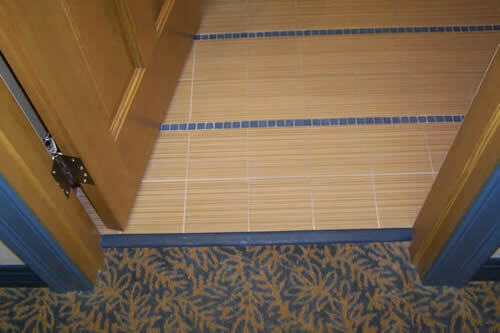 Notice the tile floor with glass tile inserts, painted wood door trim and carpet all coordinate perfectly. 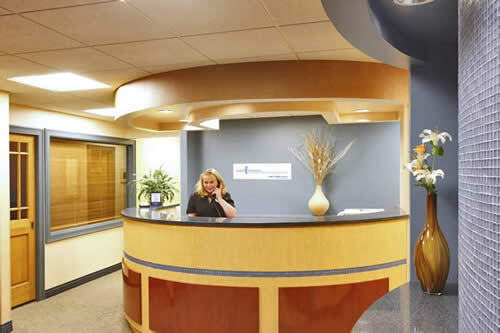 “Laura did a fantastic job of considering our vision and concerns about an office redesign. We hoped to have a design that was unique and new, but not too modern and trendy. 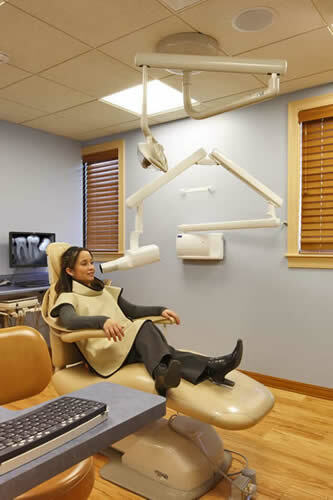 We wanted something warm and comforting for a surgical practice and that is what Laura delivered. Our longtime patients absolutely love the office and we receive compliments on a daily basis. Laura is passionate about what she does and will stop at nothing to deliver a top notch product!"